The slang �burst� has been used to describe a specific Gubson Les Paul. Manufactured from 1958 to 1960. From the dozens of guitar idols, who played it and those fortunate enough to have owned one or more, the Gibson Les Paul sunburst possesses a mystique and magic, not found in any other electric guitar. 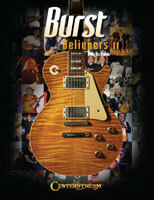 The Burst Believers collectors edition includes both the Burst Believers and Burst Believers II books, a 16 page 6 x 9 booklet of Burst �outtakes�, 8 Burst collectors guitar picks, all packaged in a custom made Burst slipcase. Limited to only 300 sets. 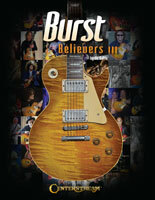 The slang �burst� has been used to describe a specific Gubson Les Paul. Manufactured from 1958 to 1960. From the dozens of guitar idols, who played it and those fortunate enough to have owned one or more, the Gibson Les Paul sunburst possesses a mystique and magic, not found in any other electric guitar. With its unique sound, spectacular beauty and playability, the burst has shaped the landscape of the blues/rock genre, as we know it today. 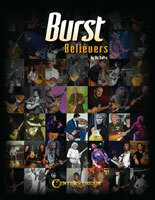 The �Burst Believers II� in this book, John Sebastian, Mick Taylor, Paul Rodgers, Drew Berlin, Dickey Betts, Randy Bachman, Matthias Jabs, Howard Leese, Paul Warren, Charlie Daniels, Billy Squire, Paul Stanley, Warren Haynes, Gary Rossington, George Gruhn, Berrnie Marsden, Robby Krieger, Phil Keaggy, Rick Vito, Tak Matsumoto, and many more, have been kind enough to share their experienced and stories that you will enjoy reading. From the hundreds of color photographs, to the serial number index make this book a �must� for players and collectors alike. The holy grail of electric guitars is back for a third time! The impact of this guitar has and continues to shake the music world. From the dozens of guitar idols, who played it and those fortunate enough to have owned one or more, the Gibson Les Paul Sunburst possesses a mystique and magic, not found in any other electric guitar. From the hundreds of color photographs, to the serial number index make this book a �must� for players and collectors alike. In this edition, Billy Gibbons, Jimmy Page, Jeff Beck, Slash, Eric Clapton, Joe Walsh, Carlos Santana, Joe Perry, Sonny Landreth, Gary Grainger, Ace Frehley, Duff McKagan, Joe Bonamassa, Albert Molinaro, Drew Berlin, Jim McCarty, Deacon Frey, Paul Stanley, Rick Vito, Rick Nielsen, Sid Bishop, John Sykes, Marcus Demi, Dzal Martin, Jack Moore, Billy Squier, Eelco Gelling, Ted Turner, Bernie Marsden, Ed King, Gary Moore, Gary Rossington, Gordon Kennedy, Mike Bloomfield, Rick Hirsch and many more. 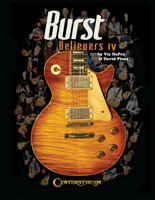 This is the final book in the Burst Believers series with some of the finest photographs and interesting articles ever seen! 264 pages. The Martin is considered the finest acoustic guitar in the world, a distinction it has held for more the 160 years. Philip Gura Chronicles the career of Christian Frederick Martin from his humble start as an importer and repairman of musical instruments in New York City in the 1830s through his move to Nazareth, Pennsylvania, and the founding of C.F. Martin & Company. Gura is the first historian to throughly study the Martin company records dating back to the 1830s. Using this rich archive, he establishes how a German immigrant from Saxony's guild tradition became the finest American guitar maker of his time. The many sketches and hundreds of photographs illustrate how Martin adapted his artisanal craft to modern industrial methods. Includes an 80-page color section!